In the months leading up to 2015’s Fall marathons, RunWashington will follow several local runners as they prepare for their races. We’ll chart their progress as they train their legs, lungs and minds for the challenges they’ll race on race day. Each week, we’ll catch up with our runners and see how they’re doing. This week, it’s Matt Deters of Arlington, Va., who is having a breakout year. Read the first article about Matt here. Matt Deters can’t take the heat. Actually, that’s not true, he can, and has been, and will continue to do so, but he’s not a fan. Running in D.C. in July and August, at its worst, can be like doing strides in wool-lined catcher’s equipment, while breathing through a sweat-soaked ski-mask. Attempts to stay hydrated are like trying to fill a pitcher with a hole in the bottom. And that’s for the average recreational runner. Deters is still run eight miles each way from his home in Arlington to his office in Foggy Bottom. On his easy days. But he has encountered some heat-related setbacks this summer, one more minor annoyance in a string of less than perfect conditions since his spectacular spring season. Since coming back from the Glass City Marathon in April, where he was on track to reach his 2:30 goal until a course marshal directed him two miles off course, Deters has continued to push hard, but the stars haven’t quite aligned. Not yet, at least. There’s another three months until Philly, during which the frequent racer will run the Army Ten-miler and the Navy-Air Force Half as tune-up races and keep pushing the pace. His most recent hiccup was after the Rockville Twilighter. Deters began to suffer almost immediately after the 8k from dehydration, sweating profusely followed by chills, and a fever. He battled that and sinus symptoms on and off for about two weeks. He kept thinking he was better, only to have to dial it back again. Deters isn’t a big fan of taking it easy, but he did use the experience as a good reminder to stay hydrated, something he struggles with in the summer months. “The heat really affects me, I’ve had a couple of slow races and difficulty finishing races and workouts at the pace I want to, those add up and you’re not getting all the miles,” Matt said of his disappointing summer. He wanted to PR in shorter distances like the 5k and 8k, but the bug he had recently and the bout with plantar fasciitis after the Glass City Marathon has kept him from doing so. He’s still finding it a challenge to get back to the form he was in this past spring, “last cycle was so perfect that it’s hard,” he said. 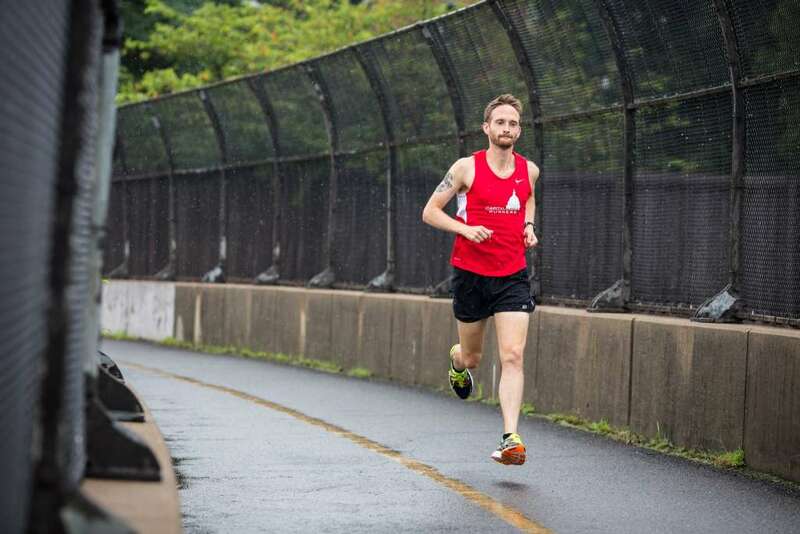 He still has his hopes for the Army Ten-Miler, as the truncated Cherry Blossom course last year meant he didn’t have an official PR. The brief setbacks of plantar fasciitis, dehydration and sinus issues get pretty harsh treatment from Matt on his blog: http://freakitypopo.fastrunningblog.com/, but in the grand scheme of things, he’s managed to stay relatively strong and healthy through significant upticks in speed an mileage. Matt Deters is hoping that his coach, George Buckheit, has a similar training plan to last seasons. He worked up to 21-22 mile progression runs, finishing up at marathon pace, and track workouts that include 25 x 400’s continuously around the track. “He’s one of the best” Matt said of Buckheit. Deters will have the same group of peers training with him this fall, Smith and Greg Mariano are both training for races on the same cycle. Out on long runs, even though their group in intense about training, Deters is always able to provide comic relief, with funny stories from the week keeping the group entertained. Deters is optimistic about his chances at Philly even though he’s not pleased with his current performances. He’s looking forward to the next phase of training, and hoping to stay healthy as he adapts to the added intensity. Alongside intense training and injury prevention, Deters makes certain concessions to age. He makes the effort to stay hydrated, eat fruits and vegetables, and lay off the beer. “I can’t eat like I did at 19,” he admits. Deters knows the training will pay off, he’s seen it already. The small things are bound to add up. He knows the heat will start to lift just in time for the ragweed to come out, and that he has some great weeks of late fall training to look forward to. Hopefully the marshals for Philly’s course are paying as close attention to the details as Deters is.